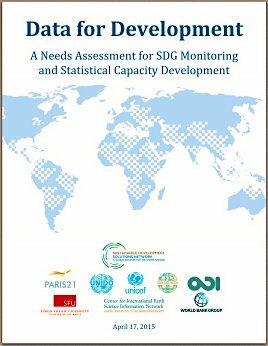 Today, the UN Sustainable Development Solutions Network working with Open Data Watch and a group of experts from academia, non-profits, and international organizations published a report titled Data for Development: A Needs Assessment for SDG Monitoring and Statistical Capacity Development. The report is the most comprehensive effort to date to calculate the financial resources necessary to improve national statistics in developing countries. The report estimates the costs of key tools for official statistics: household surveys, censuses, civil registration and vital statistics, education statistics, economic statistics, and environmental and geospatial statistics. For the 77 countries that qualify for funding from the International Development Association (IDA), the report estimates that that roughly $1 billion will be required per year. The report found similar levels of need identified in the National Strategies for the Development of Statistics (NSDS) in several countries. Budgets in NSDSs indicate that countries can reasonably cover about 50% of the expected costs, while aid will be needed for the rest. Current estimates place donor support for statistics at about $300 million per year. This suggests that donors need to increase their annual support for statistics by $200 million per year. Open Data Watch and SDSN also produced a policy note titled Data for Development: An Action Plan to Monitor the Sustainable Development Goals and Fulfill the Hopes of the Data Revolution. The note provides policy recommendations in light of the needs assessment report. It provides three key messages for policy makers: 1) build stronger national statistical systems; 2) revitalize financing for statistics; and 3) embrace the data revolution.